Keeping it fresh! What keeps you in the localization industry? On its tenth anniversary, we asked a few Board members of Women in Localization (Anna Schlegel, President and Co-Founder, Silvia Avary-Silveira, CFO and Co-Founder, and Sonia Oliveira, Director, Executive Partnerships) to enlighten us on their experiences and thoughts for the future, looking forward to the next ten years of this wonderful organization. Mimi Moore and Vikki Carter are both members of the Women in Localization (W.L.) content team. They found themselves in the somewhat unusual position of being on opposite sides of the world, with Mimi in California and Vikki in the U.K., but looking for the same thing at the same time: a career change with new and innovative opportunities. Not so unusual you might say. But making this change and starting afresh at new companies on the same day? What are the chances! 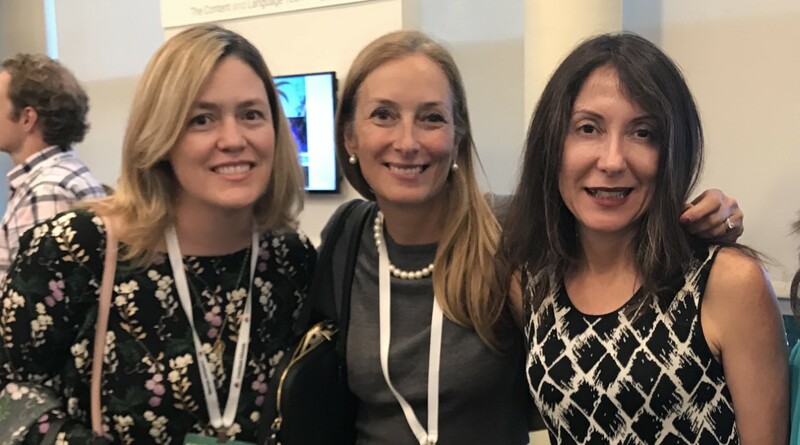 So, from 5,000 miles apart, we put our heads together and thought we would ask a few Women in Localization leaders what keeps their careers interesting, challenging and enjoyable. Their answers are honest, thought provoking and insightful; they will resonate with many of our colleagues in the global localization community. We are sure you will find their advice invaluable and we thank them for participating in our research. After many years in the localization industry, how do you keep your career engaging and fresh? Silvia: I love to learn, so I am always looking for opportunities to do so. In our industry, it is easy to find webinars, events, thought leadership articles, conferences and online courses. Many of those things are free of charge. I also like to take advantage of my network to learn from my peers and give back. Sonia: I feel quite fortunate to have chosen a career in Localization. I believe the incredible amount of transformation we have seen in the industry has helped keep careers engaging and fresh. For at least the past twenty years, the industry has experienced an incredible amount of change on the technology front, with MT and AI for example, as well as with more robust tools and collaborative platforms. We have also seen great transformation on the business landscape with consolidation and acquisitions on the providers’ side, not to mention the great deal of diversification in terms of business areas they can now support. So, keeping up with all of that, this amazing transformation is part of what keeps me engaged. More specifically, in my career I have been able to work for companies that were both well-established and start-ups which allowed me to exercise all the skills in my toolbox. Each company has its own hurdles and challenges, as well as great learning and growth opportunities, which makes our journey a lot more interesting. Anna: I have been in localization since the age of seventeen. I am now fifty! I have learned each little corner of it; QA, teaching, writing about it, being a freelance translator, being a GM for a vendor, having my own start up, and today being the Head of Information Engineering and Globalization Strategy. You must shake things up to keep it fresh – at least for me! Being part of organizations like Women in Localization is what allows me to see even more adventures – for example, in Artificial Intelligence and Globalization. If you enjoy your current role, what are the top 2-3 things that keep you there, and not tempt you to look for a change of position or company? Silvia: What keeps me here is the flexibility I have, which in return gives me the work-life balance I need. I also see many opportunities for growth and a chance to make a positive impact. There are many challenges, but it keeps things interesting. Sonia: The notion that we can always improve, learn, grow, and get even better is quite an important North Star for me. As long as I feel that I am learning and contributing, I don’t feel a need to change positions. Anna: I love my current role; what keeps me there are definitely the people. I work with an incredible team. After that, the fact that we are all passionate about innovation, and we don’t settle, is quite something! What is the most important thing to you when evaluating your career in localization? Silvia: It depends on the phase of my life. For example, when I was younger, my focus was growth opportunities and salary. Now that I have a family, I still value growth, but I value even more flexibility and work environment. I need to be able to work flexible hours, so I can be there for my family, and I also need to enjoy working so it is worth being away from them. Sonia: The incredible experience I have been able to gather along this journey. How much I have learned and hopefully how much I have shared. It’s been an incredible ride and there’s so much more to look forward to. So, when I evaluate my career, I feel fortunate for what I have lived through so far and very energized for what it is yet to come. Anna: I never envisioned a career in localization, it did not exist. I fell into it and I think I can say that I helped create it when we wrote the first localization certificate in California years ago with Nitish Singh, and that everyone at Women in Localization is creating it. But I did not search for it! I wanted to be a philosopher! Who or where do you turn for inspiration if you find yourself considering your work situation, and how do you evaluate whether making a move to a competitor or another company (or even out of the industry) would be in your best interest? Silvia: I usually discuss this with my family. They help me evaluate the options, since any change affects us all. I also turn to people in my network that are closer to me for advice and I try to find people that might know my future boss/company to learn about the culture. Sonia: I always need to believe in the company I work for, otherwise it would be difficult for me to feel authentic and engaged in any role. I find that change can be quite exciting, but to me it is only worth it when it’s apparent that the impact you will have in the new organization is larger than the one you are currently experiencing. Anna: I turn to Harvard Business Review, The Economist, IDC, I listen to my team, I participate in a lot of Forums. Then I create my work situation. I like to invent from seeing a cross-functional puzzle outside of our area. If an application, process, or idea is good for another career or business problem, why not for globalization? There are many business practices to use in globalization. They are all out there, and you just need to put them together. What tips do you have for others in localization to keep their careers fresh? Silvia: Take advantage of the many free webinars, events, and digital content we have. Talk to people, network, network, network, and go to conferences if you can. Sonia: If you are fortunate to love what you do, it should not be that difficult. If you are in the localization industry, keep yourself well-read and well-informed. Attend conferences, participate in forum discussions, join professional groups (such as Women in Localization!) and be aware of the latest trends. The world is multilingual, and our interdependency is stronger than ever. Our industry will continue to play a critical and central role in new, exciting and innovative developments. Anna: Talk to folks in different roles and spend time on your career. Plan it better than you’d plan an awesome vacation. What does Women in Localization’s 10th anniversary mean to you? Silvia: So much! It is with pride that I look back and realize how we have matured and grown. When we started, we were a local group of professionals looking for connection and opportunities to learn and share. We were so local that our name used to be Northern California Women in Localization. Then we decided to go global, and that was one of the best decisions we ever made because we became so much bigger and we developed partnerships to create great things for the localization industry. So, it allowed us to not only help advance the career of women in localization here and abroad, but also the localization industry. Now, we are celebrating a new milestone for W.L., we have achieved Non-Profit Status, and we believe we will be able to do even more great things in the future. To the next 10! Sonia: It’s an incredible milestone. I am one of the early members and it feels like it was just yesterday when I attended the first meeting. Today W.L. is a vibrant and ever evolving organization, with over 4,500 members and growing fast globally! So exciting to be part of it. I am so proud to be able to contribute, especially as a Board Member. Cheers to all the hard work these amazing ladies have put into this organization. Anna: We have been on calls and meetings for ten years. Wow. Silvia and Eva (Klaudinyova) are my amazing partners throughout these past ten years. I am so grateful we pulled it off with the leadership and support of hundreds. However, we have had to open up, and learn how to listen to many advisors and experts to get us where we are. I have learned a lot! So, the actual anniversary commemorates our journey of our own growth. I guess we had a good idea! Anna’s last sentence says it all. A good idea indeed! Big congratulations and appreciation to the hard work these wonderful ladies put in at all stages for Women in Localization. Thank you and happy 10th Anniversary!